On June 13, 2016, the 3rd Asia-Pacific Internet Resources Capacity Building Program (APICB) was held in Beijing at Jingyi Hotel. 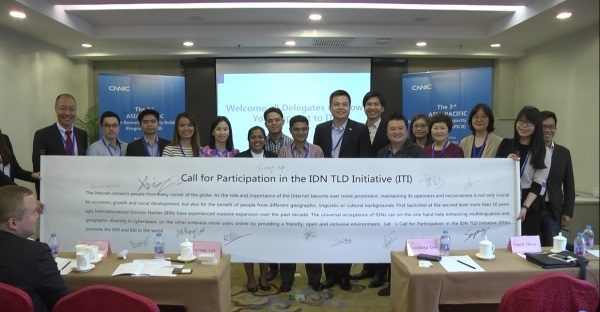 This program was co-organized by China Internet Network Information Center (CNNIC), the Internet Corporation for Assigned Names and Numbers (ICANN) and Asia Pacific Top Level Domain Association (APTLD). More than 20 delegates and technology experts of the industry from over ten countries and regions, including Russia, Singapore, Thailand, Laos, Sri Lanka, Nepal and South Africa, as well as European Union Delegation to China were invited to attend the program. During the five-day program, in-depth discussion on hot topics such as Internet governance, DNS and DNSSEC technology, application and promotion of New gTLD, IDN and EAI, etc. was held among delegates and experts. Additionally, they exchanged technology information and shared their experiences with famous Chinese Internet enterprises represented by Alibaba. According to the statistics about Internet usage issued by International Telecommunication Union (ITU), by the end of 2015, the number of Internet users had reached 3.2 billion, of which 2 billion were from developing countries. However, there are 4 billion people from developing countries who have no access to Internet; they account for two thirds of the total population of those countries. The longstanding uneven development within and among those countries had always been a big concern of Internet institutions in the Asia-Pacific region. Xiaodong Lee, President and CEO of CNNIC, said that in order to improve the Asia-Pacific Internet environment and boost the interconnection and intercommunication of digital information society in developing countries, this program was committed to building a long-term platform of mutual help and cooperation in the Asia-Pacific region, enhancing the Internet resources capacity building, and spreading and exchanging knowledge and technology of the industry, so as to elevate the position of Internet institutions and organizations in the Asia-Pacific region　among the international communities. During the program, representatives from ICANN, APTLD, Asian top level domain registry DotAsia, European Union Delegation to China and South African domain registry ZADNA among others shared achievements regarding Internet technology, policy, strategy and innovation. It is noteworthy that the inauguration and signing of ITI were held at the opening ceremony of the program. The establishment of ITI was conducive to the research and application of IDN and EAI worldwide, facilitating international information-sharing. Participants were readily engaged in formulating the mechanism of ITI and making work plans for the next stage. In addition, related materials and videos of the program will be posted on the online learning platform of ICANN – ICANN Learn – a platform for sharing best practices and discussing cutting-edge issues of the industry.